Are you in need of a copier for your business? Well at Copier Los Angeles we offer a variety of options to get your business running. 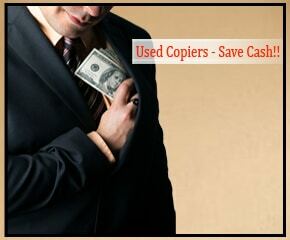 We offer fair leases, but if you want to avoid monthly payments then we also have the best used copiers in LA. Our used copiers are in great condition and we know we can find what you need for your business. At Copier Los Angeles we carry used copiers that are still in great condition. We want to make sure then you have the machine you need for the jobs that you need done. We understand that being on a lease can be stressful. Nobody likes to have another monthly payment to worry about. With used copiers you only have one upfront cost and then the copier is yours. And you can still get services like maintenance and supplies from leasing companies if you need it, without being stuck to a lease. We offer the best selection of used copiers in LA and we have the experience to make sure you get what you need. We can help you find exactly what you’re looking for at a price you will love. All our used copiers were meticulously maintained by other businesses before they get to you. We offer a 90-day return policy if you encounter any problems, so that you are not stuck with a lemon. If a used copier sounds like the perfect solution to your print and copy needs then give us a call today. Copier Los Angeles has the best used copiers in the area and we believe in putting customers first. Call us today and we can answer any questions you have about your first used copier in Los Angeles.